– Herbs and spices, such as parsley, thyme, bay leaf, cloves, salt, and black pepper. Although it takes a long time, the recipe is very easy. Nothing is coated with flour, browned, or fried and there’s only one pot to clean. When I was ready to photograph my pot-au-feu, I discovered that I didn’t have a platter big enough to hold it; it makes a LOT of food! Next time I make it, I will plan ahead and try to get an authentic photo to replace the one above, which came from Wikipedia. Slice the leeks lengthwise and rinse well, checking between layers for dirt. Wash and peel celery root, if using, Clean and trim other root vegetables, but leave them whole so they won’t fall apart. Drive the cloves into the onion so both can be easily removed. Set aside. In a large pot, combine the cuts of beef and the marrow bones and cover with cold water. Place over high heat. As soon as the water starts to boil, turn off the heat. Remove the meat and bones from the pot and discard the water. Thoroughly wash the pot. (Don’t skip this step!) 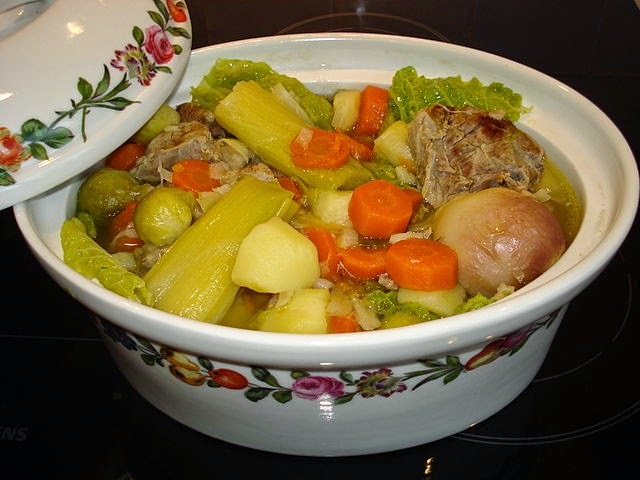 Put the meat and bones back in the pot or transfer to a slow cooker and add the leeks, onions, carrots, rutabaga or turnip, celery root, if using, thyme, parsley, bay leaf, cloves, and peppercorns to the pot. Add salt and cover with cold water. Slowly heat the pot to a bare simmer, cover, and let cook over low heat for about 2½ to 3 hours, or until the meat is tender. Add additional water if needed. Do not stir vigorously or let the pot come to a boil to keep the vegetables and meat from falling apart and to keep the meat tender. It may be necessary to turn off the heat occasionally or set the lid askew if your burner does not go low enough. Skim the cooking liquid with a ladle periodically to remove scum and foam. Add the cabbage and cook for an additional 30 minutes, or until tender. Taste and adjust the seasoning if needed. Remove the meats and vegetables from the pot. Cut beef and ribs into portions. Place meats and marrow bones on a large platter. Discard the parsley, thyme, leeks, and onion. (You may remove the cloves and serve the onion.) Cut up the vegetables and arrange around the meat and bones. Spoon some of the cooking liquid over the platter. Strain the remaining broth, add a pinch of nutmeg, and serve as soup for a first course or with the meal. Put the cornichons, sea salt, and mustard into separate dishes and serve with the pot au feu. Provide marrow scoops or other small spoons for digging out the marrow from the bone cavities. If the herbs are tied together with string, they are called a bouquet garni. Note: This is an estimate only: data not available for some of the items in the recipe. Beef and Vegetable Stew, One Pot Meal. Bookmark. Great one – thanks for sharing. You are most welcome, Afifi. I hope you will enjoy it as much as we did! Any reason this couldn't be done in a crockpot (call me an Ugly American!)? Seems as if it'd be a constant low temp, and could be ignored all day if one was at work. I know I will make this, either as written or in the crock. Thanks for the recipe. No, Carole, I think using a slow cooker would be ideal. Putting it in the oven might be even better as it would be less likely to ever boil, which might cause the ingredients to fall apart. It would also be easier to regulate the temperature than on the stovetop.